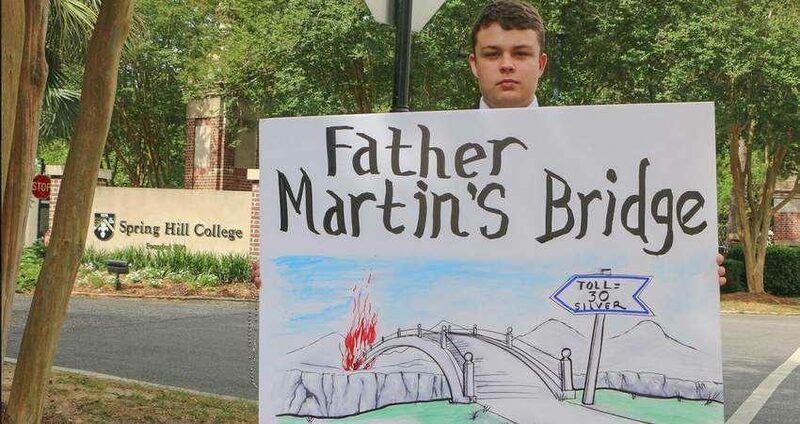 Catholics gathered at the entrance of Spring Hill College in Mobile, Alabama, on May 5 with a prayerful purpose: To oppose a commencement address by Fr. James Martin, S.J., a vocal pro-homosexual priest who sows public confusion within the Church by promoting the normalization of transgenderism and unnatural sin. Leading up to the commencement ceremony, TFP Student Action gathered 17,489 signatures on a petition to Dr. Christopher Puto, president of the Jesuit-run college, urging him to "find a new speaker who respects and loves the perennial doctrine of the Catholic Church." The voices of young Catholics, alumni, and parents, however, were ignored by the college, prompting the physical protest at the intersection of Old Shell Road and Portier Lane, organized by the American TFP together with local pro-family advocates. "Fr. Martin's bridge to sin offends God." "True compassion leads to virtue, not sin." And "We support Catholic teaching & reject Fr. Martin's attempt to normalize homosexual acts." In his rainbow-covered book, Building A Bridge, Fr. Martin attempts to mix good with evil and reconcile the homosexual movement with Catholicism. Recalling the words of Our Lady of Fatima, one young protester expressed his concern, saying, "Our Lady warns us that more souls go to hell for sins against the 6th and 9th Commandment, sins of the flesh, than anything else. So she, you know, wants us to live chaste lives. And that's primarly what Fr. Martin promotes -- sins of the flesh." As the peaceful protest ended, everyone knelt on the sidewalk to receive the priestly blessing of Fr. James Dean, pastor at Sacred Heart Chapel. "I know the power of prayer can turn things around," said a concerned Catholic at the protest. "Because we're in a crisis right now and we need help." Mentioning her devotion to Our Lady Undoer of Knots, she added, "Boy do we have a knot here and we need to pray to the Blessed Mother to start loosening this knot and maybe together with her we can untie it." Fr. James Martin will also be delivering a commencement address to 750 graduates and receive an honorary doctorate from Loyola University in New Orleans, Louisiana, on May 12, 2018. The Loyola graduation ceremony will be held in the Superdome and, once again, Catholics are planning to gather at this location to stand up for the holy teaching of the Catholic Church and reject the pro-homosexual agenda of shepherds who act more like wolves than true pastors. said Catholics should "reverence" homosexual "marriage" supports transgenderism for children favors homosexual kissing during Mass called dissident, pro-homosexual nun a "saint" welcomed award from group condemned by the USCCB. Where: Downtown New Orleans Poydras St. and Lasalle St.
Bring your rosary. Invite your friends. Stand up for the perennial teachings of the Holy Catholic Church. To receive more information, contact Thomas Drake or Ben Broussard at (504) 784-8272.